The cause of Trichotillomania is unclear. But like many complex disorders, it was thought it is a combination of genetic and environmental factors. has been hypothesized to lie on the obsessive–compulsive spectrum, it was included in the group of obsessive–compulsive disorder, nail biting and skin picking, tic disorders and eating disorders. It is associated with irresistible urges to perform unwanted repetitive behaviour. Magnetic resonance imaging (MRI) studies have demonstrated that some individuals with Trichotillomania have abnormalities of the lenticulate. Abnormal brain metabolism ,serotonin deficiency,: Positron emission tomography (PET) scans have revealed that some individuals with Trichotillomania have a high metabolic glucose rate in the global, bilateral, cerebellar, and right superior parietal areas. The lifetime prevalence is estimated to be between 0.6% (overall) and may be as high as 1.5% (in males) to 3.4% (in females). Hair pulling occurs in a "trance-like" state; hence, Trichotillomania is subdivided into "automatic" and "focused" hair pulling. Children are more often in the automatic, or subconscious, subtype and may not consciously remember pulling their hair. Other type is focused, or conscious, rituals associated with hair pulling, including seeking specific types of hairs to pull, pulling until the hair feels "just right", or pulling in response to a specific sensation. Knowledge of the subtype is helpful in determining treatment strategies. Anagen - Growth Phase - Approximately 85 percent of the hair on head is in the growing phase at any given time. This phase can last 2 to 6 years. Hair can grow at the rate of approximately 5 inches per year. Catagen - Transitional phase. When the Anagen growth phase comes to an end, hair enters into a Catagen phase which lasts about one or two weeks. During this transitional phase, the hair follicle shrinks to about 1/6th of the normal diameter. The "root" is diminished and the dermal papilla breaks away and rests below the scalp. Telogen - Resting Phase. After the catagen phase, hair goes into a resting phase known as Telogen. This period can last five to six weeks. Although the hair does not grow during this stage, the dermal papilla stays in the resting phase below the scalp. Approximately 10 to 15 percent of all hairs on head are in this resting phase at any given moment. Areas of active plucking can convert hairs from Anagen over to catagen then to Telogen. Because catagen hairs only account for approximately 1% of hairs on the scalp, the presence of 2 to 3 catagen hairs in a specific biopsy can be suggestive of a diagnosis. Hair pulling is a way of dealing with negative or uncomfortable feelings, such as stress, anxiety, tension, loneliness, fatigue or frustration. Leading to Social problems. 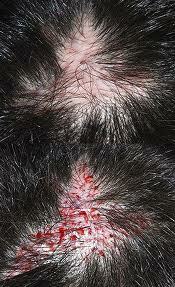 On the scalp, there are multiple, broken off hairs in irregular patches in varying lengths. Biopsy can be confirmatory. 4. The disturbance causing clinically significant distress in social, professional, or personal areas of functioning. Acknowledgements: I thank my patient for her co operation in above said article. • Life space investigation: patient is a one of the two female children to well educated working parents, good childhood, good primary, not satisfactory middle and higher secondary education; of late she has become loner by spending more available time with PC. 070710 better but hair plucking was persisting Sepia 1M 2doses were given with 15 days placebo. 170710 as menstrual bleeding was copious, the following investigation were done Hb % was 10.5 gm, U S Scan was done of whole abdomen: impression was no abnormality only endometriam was 8mm. Hamamelis 1m, one dose was given and 15 days placebo was given. 280710 no hair plucking but hair growth was minimum ,weakness was present Ferum phos 3X 4grains twice a day was given along with iron rich diet. 110810 she came with history of diarrhoea for two day history Aloes 30c 7doses were given 15 days placebo and asked her to report after 3days. 250910 she came with mild pain in abdomen with white discharge, with occasional stress induced hair plucking Sepia 1M 2doses were given with 15 days placebo and Ferum phos 3X 4grains twice a day was given. 28 032011 she came along with her Hb % was 12.5 gm, U S Scan was done of whole abdomen : impression was no abnormality only endometriam was 6mm, her general condition was good no stress induced hair plucking , periods were normal .Thuja 200C 3doses were given along with 15 days placebo and Ferum phos 3X 4grains twice a day..
International women’s day was celebrated with great enthusiasm at Devs Homoeopathic medical college on 8th March 2013 in the college premises , authorities conducted a elocution competition on the “ Role of women as decision making “ good number of students participated , the following were winners of the competition: Prizes were sponsored by Prof Sitha Mahalaxmi in the name of her mother. As this word are correctly and exactly suited for Mahatma Gandhi because he once said in 1911 in Ahmadabad that a “Leader is not made by anyone instead he has borne himself”. People think that a teacher makes a child into art, but the teacher makes and gives a stimulus to the child in which way his travel. This says that a person cannot be taught by anyone but a stimulus is given. We have living and non-living things different because a soul is kept in the body makes a living. The soul is not a shape but a luminous and virtue of the body. Swami Vivekananda was preached by guru Rama Krishna Paramahamsa that “you are like a plain white paper at morning and before sleeping areas the scrap and keep the good ones with you”. This means a white paper in and out will be same just like a human with no jealousy and no depressions. So, he will be pure and there will be external and internal and remove the scrap means when unwanted things are removed there will be space for good and wanted things. So here his teacher does not teach him anything instead he showed the right and the rightful path to Vivekananda. Which means what you think internally that will be your results. For example:-If a doctor thinks that, I should earn more money and wealth means he will be the first to suffer because a patient comes to doctor with pain and her doctor is greedy so the patient feels more pain from external and internal. The wealth with doctor gets also waste here. Dr.Hahnemann did not go to school up to his 9years but learnt many things because his father says that “don’t be passive listener, be an active listener”. He soiled these words and without any knowledge of Anatomy and Physiology, he has given an article named as “A beautiful construction of the human hand”. Here we should know the point is miracles can be done by a person when he commits something without teacher he can do many things. This was practically proved. We have one more example the famous”Ekalavya”. We all know him as a good and perfect disciple to his guru “Dronacharya”. He has no teacher instead a statue of his guru. He learnt himself many things in archery. MY WORDS: - So none can teach you but show a path to travel. Be like water because water takes container shape but not the essence and material. So adjust to every situation.